RIPT Apparel: Free shipping on orders $40+ - Blog @ That Awesome Shirt! 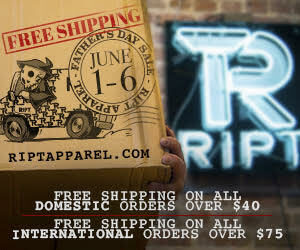 Here’s a chance to snag a great deal for the perfect Father’s Day gift at RIPTApparel. Now through June 6th, we’re offering FREE shipping on all U.S. orders over $40 and international orders over $75 -- no promo code needed. Ends 6th of June, 2017. Stock your cart with our favourites or check out riptapparel.com.